So, I've been back from vacation for a week now. I've downloaded my photos and will be writing several new posts. I can tell you one thing, my vacation was very wet. It rained every day that I was gone, so I had to base my activities on keeping dry and warm. Now, I know that the winter months are the wetter months in California; however, the rain during my vacation was quite outside the norm. I am, however, excited to be able to write about several new topics, since I got to go to some places I hadn't been before in San Francisco. Unfortunately, I did not make it to Mendocino as I had hoped, but I certainly plan to go there in the future...maybe some September or October...when it's sunny and warm. I'll leave you with a photo of one of the funnier sights I saw while in San Francisco. 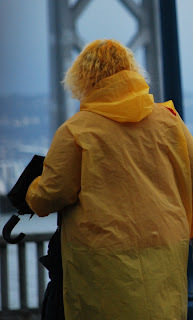 No offense intended to anyone who likes their hair color to match their raincoat.